Between Sandy and the spreading hostilities in the Middle East, caring and sharing has become even more important. Devote this weekend to giving more. Sign language for give: Starting wth closed fists pointing at each others held at your chest, push outward, openomg palms and hold ing upward. Hard times are making it difficult for many to take a break. When all you own has been destroyed, when you live in fear for your life, the caring of others matters in moving forward. If that is what you are living with as much as you would like to take a break, it will not be easy, but is even more important if you want to move forward. At the same time, if you can read this, you and your children are in a position to practice the kindness involved in sharing and caring even if living in the midst of trauma or war. Don’t neglect your self, but also do what you can to help others. November 13th was world wide practice kindness day. I posted on it, but as many remarked, kindness needs to be practiced every day and I would add throughout the day. This post is about practicing and teaching kindness. Tip two: By the time your kids are entering school, teach them tithing. For every gift you give someone, donate 10% of the gift’s cost to charity. The receiver can pick the charity. As suggested above for many children putting the money in a charity coin box is fun and re-enforces giving. For an added learning bonus, think of holding back 10% of every gift and depositing it in a savings account to be given to the child when he or she is twenty one. Tip three: Use holidays to emphasize giving back. Use the time between Thanksgiving, Christmas, Hanuka Kwanzaa and the New Year to give. Tip four: Give directly by reaching out personally with a helping hand. Visit the elderly, train service dogs, exercise dogs at a shelter. Take the kids with you once you deem them old enough to help. Volunteer your family and your kids to work in a food kitchen regularly. Tip five: Teach and practice good manners. 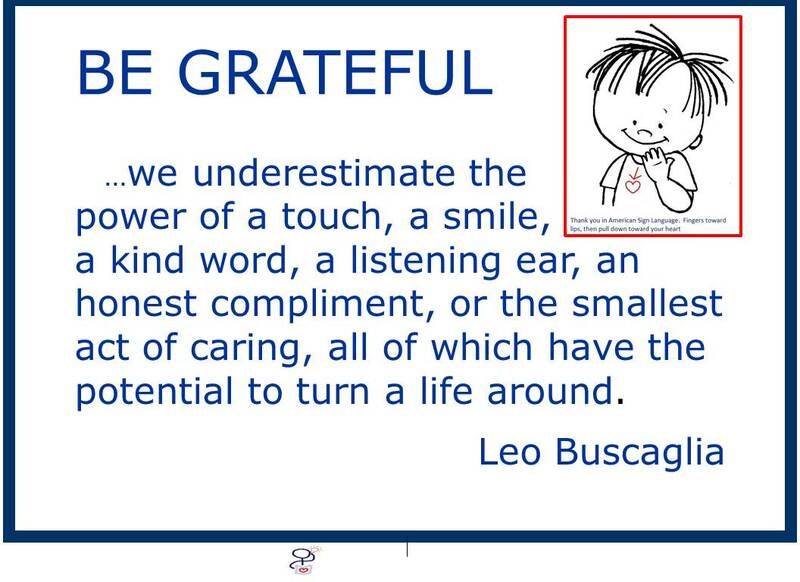 Saying “Thank you,” smiling, being respectful, offering to help are all ways to practice kindness throughout the day. Tip six: Give out of the box. Giving to your own is easiest, but world peace is built by giving to your enemies or those you think unworthy of your kindness. Tip seven: Use traumatic and bad world events for teaching both giving and gratitude. Give to the Red Cross, give blood and take your mature enough kids with you at least once. Tip ten: If you did not see the Reblog about how Sandy’s victims are giving to each other on my EFTI blog, go there now and read it. Read at least one of the stories to your children and discuss with them how they can help some of Sandy’s victims or others that are living truamatic times. Tip eleven: Do not forget long standing needs of smaller not for profit organizations. Sandy has affected the USA, but past hurricanes have damaged other poorer countries. Haiti still needs help. The Haiti Initiative is a not for profit organization started by a young woman I know personally. She not only raises money, but goes and lives with the impoverished. The wars in the Middle East are on-going and sadly too many want to see Israel and the Jews destroyed while repressive regimes stay in power. One of my former students left a plush life in New York and went to Israel as a young bride. She not only raised for children, but started and developed the Big Brothers and Big Sisters of Israel in an effort to help the young of that area stay strong. Tip eight: Teach that being kind brings its over reward. Even if rejected or accepted hostility kindness matters. Doing the right thing is an important path to feeling good about yourself. Tip nine: Print up a poster similar to this, frame it and post it were you and your children will see it everyday. Tip twelve: As you give practice gratitude. You will be strengthening you and yours by practicing two of the Daily Twelve Emotional Fitness Exercises. I assume if you are reading this, no matter how hard you have it, you also have a great deal to be grateful for. Being grateful means saying thanking you, but also putting your gratitude into acts of kindness. I hope this post has given you a few idea about how to do that while taking your break. If you buy any of my books, please review where you bought it or leave a comment on my blog. Thank you for helping me stay strong. As I tell myself a thousand times a day, stay strong, and give lots of love, have lots of luck. This entry was posted in Parenting Issues and tagged Big Brothers and Big Sisters of Israel, Haiti Initiative, inspiration, Parenting advice, parenting tips, parents, postaday, Practicing Kindness, Take A Break, teaching kindness. Bookmark the permalink.